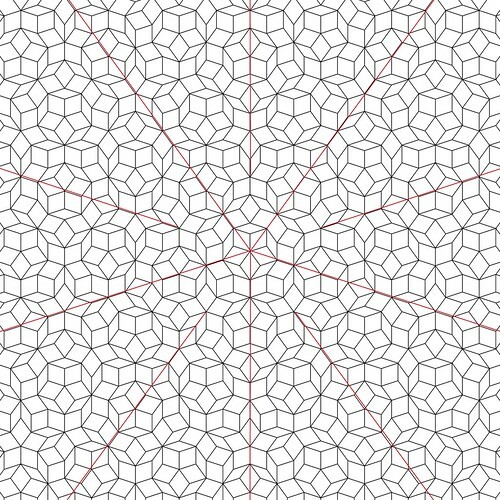 Ever seen a Penrose tiling before? Take a look at the image over to your right. It's gorgeous and fascinating and strangely hypnotic. I discovered that while a few people had made small-scale quilts of Penrose tilings, no one appeared to have attempted a full quilt made only from the tiling. It took my computer quite a few minutes of chewing before it was able to render out a 7-iteration version of the tiling, which was big enough to fill a 100" square grid with tiles of a size that would be manageable in fabric. I want to do this design in a quilt. I don't know the colors yet, but I could see how this design could become an obsession. In pure fabric-cutting terms, it's simplicity itself: nothing more than two very simple, straight-edged shapes. The beauty is in the arrangement, and the five-fold symmetry, which is both aesthetically pleasing and a little unsettling. Those are my seven-iteration Penrose tilings that I'll be working from to design my quilt. They're freely given. 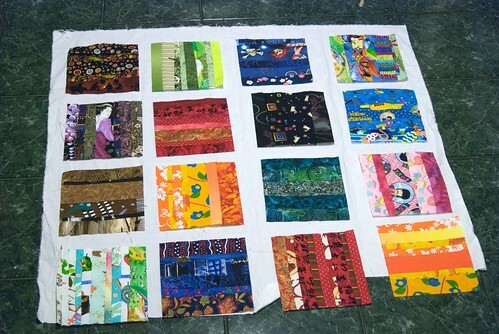 They're in a 100" square, so you could design up to a king-sized quilt using them. If they're useful to you, or inspire you in some way, I'd love to see how. There's no reason there shouldn't be more Penrose quilts out in the world. Thank you thank you for sharing the penrose graph paper!!!!! !